Sadly, few people remember the Sojourner rover today. Sojourner was the Mars Pathfinder robotic Mars rover that landed on July 4, 1997 and explored Mars for around three months. It has front and rear cameras and several science experiments. It was a pretty big success; it was designed to last 7 to 30 sols (Martian days), but it managed to last 83 sols. The rover had a mass of 11.5 kg, which equates to 10 pounds on Mars or about 25 pounds on Earth. Sojourner is 65 cm (2.13 ft) long. 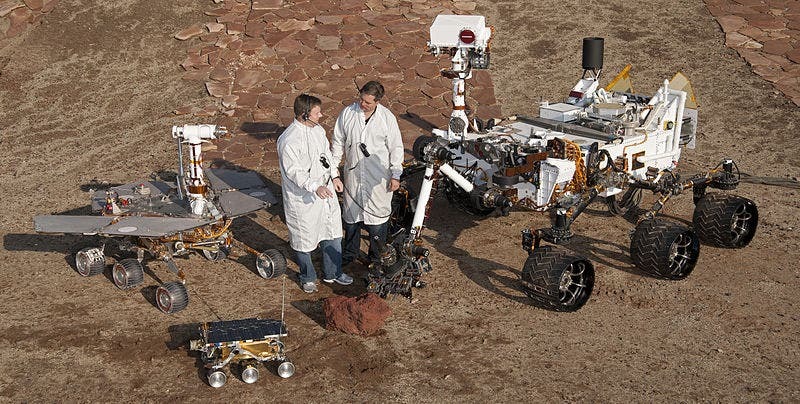 The Mars Exploration Rovers (Spirit and Opportunity) are 1.6 m (5.2 ft) long. Curiosity on the right is 3 m (9.8 ft) long. Spirit and Opportunity took things to a whole new level. The planned duration for the rovers was 90 sols, and Opportunity lasted for 3752 sols! It’s still active now. Spirit functioned until getting stuck in 2009 and ceased communications in 2010 – still a fantastic performance. Having exceeded all expectations by over 10 years, has provided substantial evidence in support of the mission’s primary scientific goals: to search for and characterize a wide range of rocks and soils that hold clues to past water activity on Mars. In addition to investigating the water, Opportunity has also obtained astronomical observations and atmospheric data. 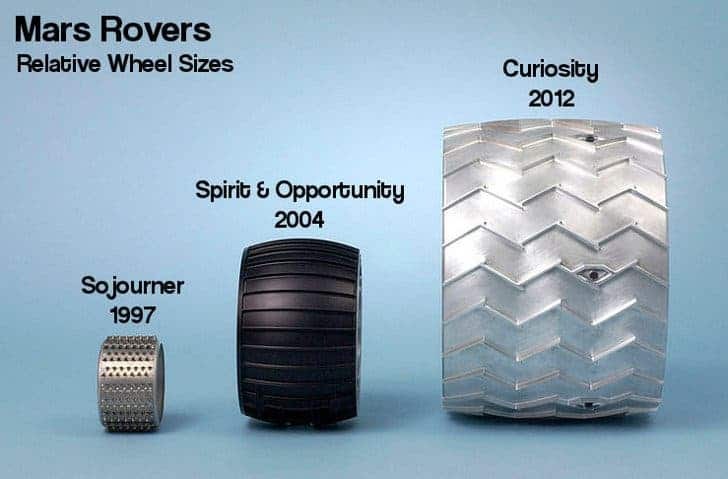 Curiosity is the biggest vehicle we’ve sent on Mars. With the awesome results from previous missions, Curiosity has some big shoes to fill. It completed a full year on Mars on the 24th of June, and it already showed that Mars once had environmental conditions favorable for microbial life. Curiosity has an advanced payload of scientific equipment on Mars, and if previous missions are an indication, then we can expect it to go on for a long time.